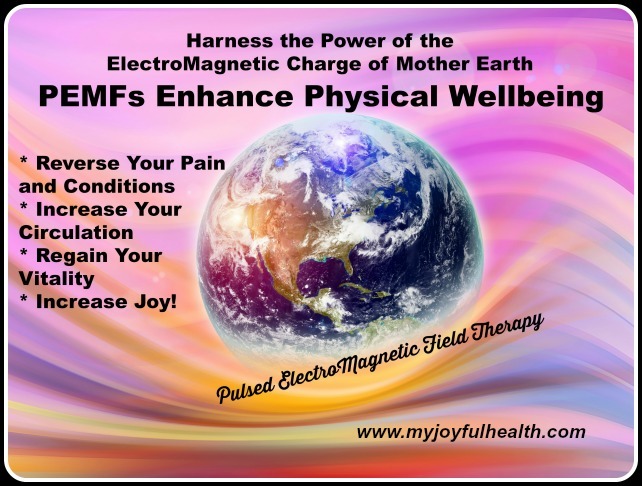 PEMF – The Health and Joy of our bodies depends on the health of the Electricity and ElectroMagnetic fields within our body and surrounding our body. Next to Oxygen, the Magnetic Field of the Earth is more Critical to the Life of Your Cells than anything else. We all know essential priorities for human life and for health, are Air/Oxygen, Nutrition/Food, Water, and Sunshine. Well – equally important is the Earth’s ElectroMagnetic Field. I have studied Nutrition and Health for decades, but always felt that something was missing for truly vibrant health. Well – now I have found it! This is THE missing link. The technology has been around for 20 years but only recently available for use in homes. The PEMF (Pulsed ElectroMagnetic Field) Omnium1 Mat by Swiss Bionic is the new way to get healthy and stay healthy, with your own Whole Body Mat at home. It is like a day at the spa, or a day in nature. We are meant to get our energy from the Magnetic Field of the earth. PEMF – You are getting a Super Dose of Nature through Technology! The Pulsed ElectroMagnetic field generated by the Omnium1 Mat helps every cell in your body to restore its optimal functionality and this is the essence of human health on the cell level. I heard the term “dirty electricity” only a few years ago. This is a different frequency than what our bodies can tolerate. Earth’s magnetic field has declined over 50% in the last 300 years and continues to decline. This 17 Minute Video is a professionally made rendition of Chapter 24 from Brian Tracy’s upcoming book “Beat the Curve”. Chapter 24 is a contribution to the book by Bryant Meyers entitled “The Future of Energy Medicine is Here!” which is THE best short overviews available of PEMF Therapy. If you want to know what PEMF therapy is all about, but don’t have much time, then watch this video!! 27 Minutes Complete all in one Video overview of the book, “PEMF – The 5th Element of Health by Bryant Meyers”. We want Good EMF – ElectroMagnetic Frequencies – These are what we Need. I want our children to be healthy and to have the wonderful experiences out in nature that I had growing up. Our children are getting more and more of the “Bad” EMFs (ElectroMagnetic Frequencies) from wireless, cell phones, computers. They need to be getting more from nature, fields, lakes, forests. Coming to our rescue is the PEMF “Good” EMFs – the Pulsed ElectroMagnetic Frequencies – based on science, working with the frequencies of Nature. Watch this video, with baby loving the PEMFs of the Omnium1 Whole Body Mat. Investing in a PEMF mat for your health is one of the best investments you can make. The iMRS is the only system to offer this waveform frequency and intensity as used by NASA. Get instant access to a lot more valuable information created exclusively for you!